There is no ‘Once upon a time’ in this story because Super 8, Single 8 and the Small film had been around for a very long time. It was in the early 60’s that pre-recorded reels of film were made available to the general public, which almost always were classic comedies (Chaplin, Laurel & Hardy, Keaton, etc. ), or cartoons from Disney and alike. 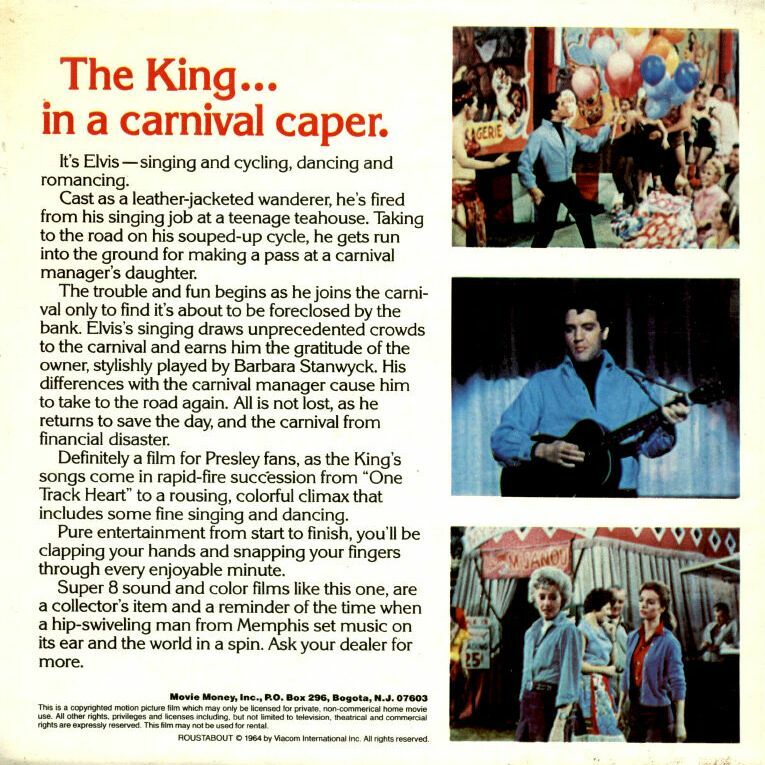 Our story becomes interesting from the mid 1970’s when the first Elvis Presley movies were released in the Super 8 (Small Film) format. In the 70’s and early 80’s, Super 8 was the way to have a home cinema experience. * The 1st category are the ‘Common’ releases which can be anything from movies, tv shows to trailers. * The 2nd category are the ‘Bootlegs’ which also contain the above subjects. * The 3rd and last category are the ‘Home Movies’: personal movies shot by fans of our main man, like during concerts. The 1st category were the releases made for the general public that could be either rented or bought. 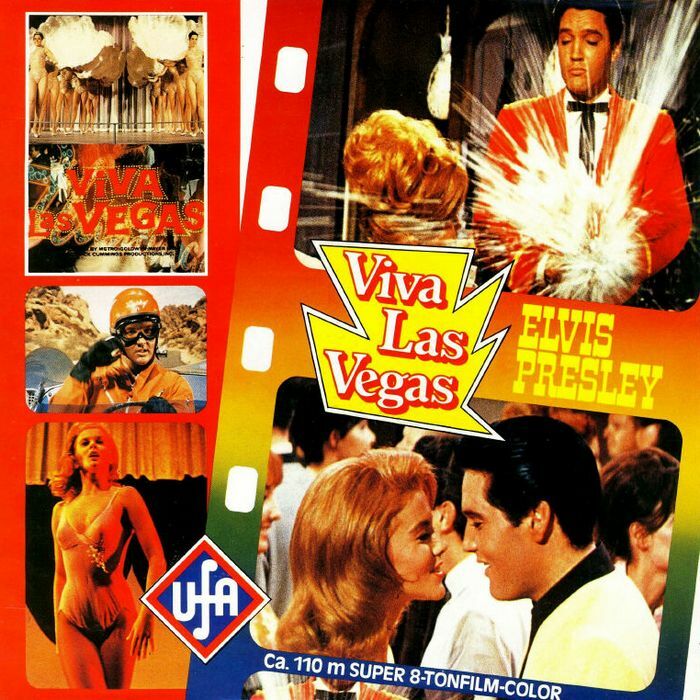 In 1976 Ken Films in the USA obtained the rights to many Hal Wallis productions including four Elvis titles which were released in 1977 as abridged (17 minute) versions. 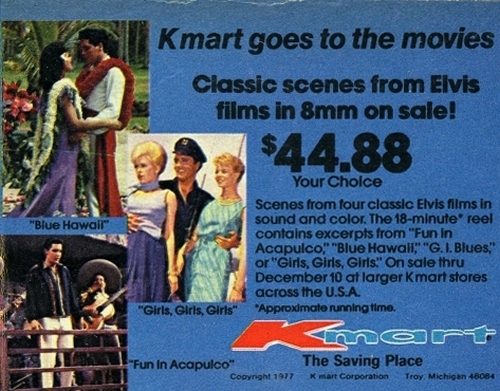 A flyer from Ken Films advertising their 4 new Elvis movies on Super 8 (1977). 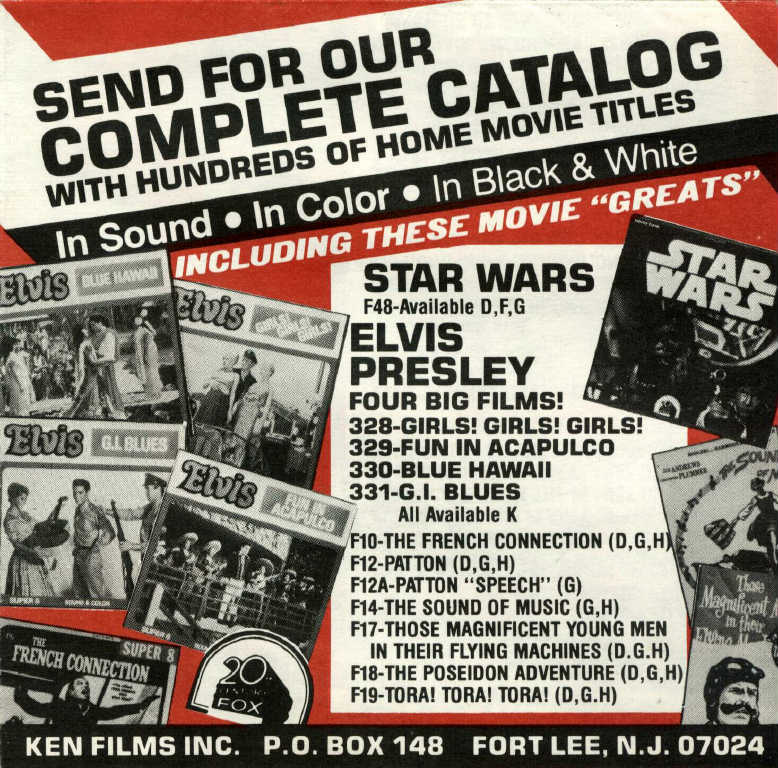 K-Mart ad for “four classic Elvis films in sound and color” (1977). In Europe, around the same time, Inter-Pathé from Germany also released these 4 titles, a few months later followed by the German speaking versions of these films. 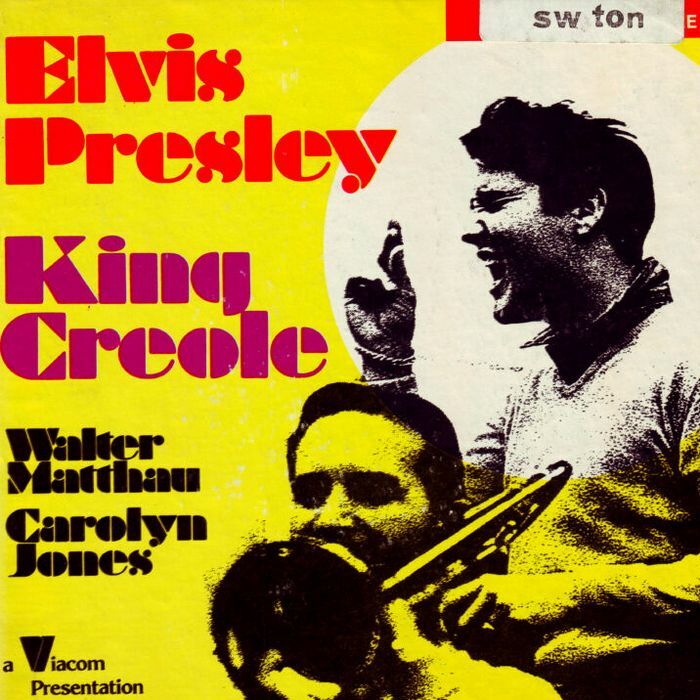 they released a two-reeler version of King Creole as well as abridged versions of Roustabout and Paradise Hawaiian Style. 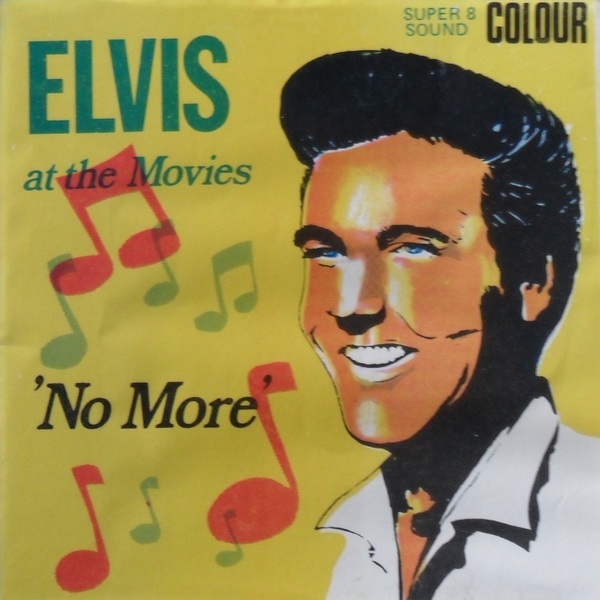 And also the 68 Comeback became available (as Elvis Presley Singer-Show 68). 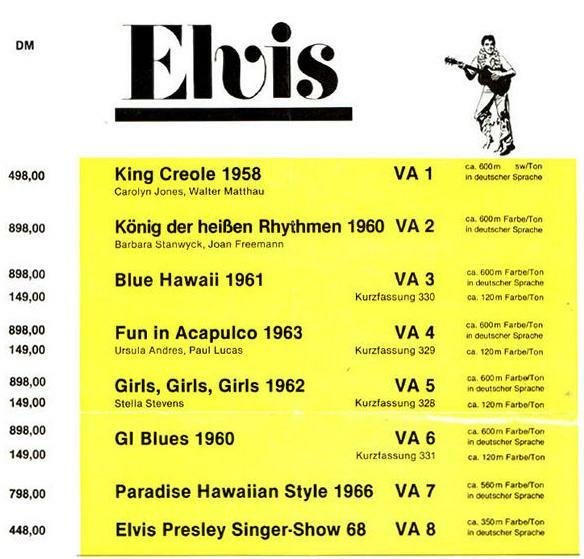 Viacom in the USA, and Derann in the UK, then released the complete versions of the movies King Creole, G.I Blues, Blue Hawaii, Girls! Girls! 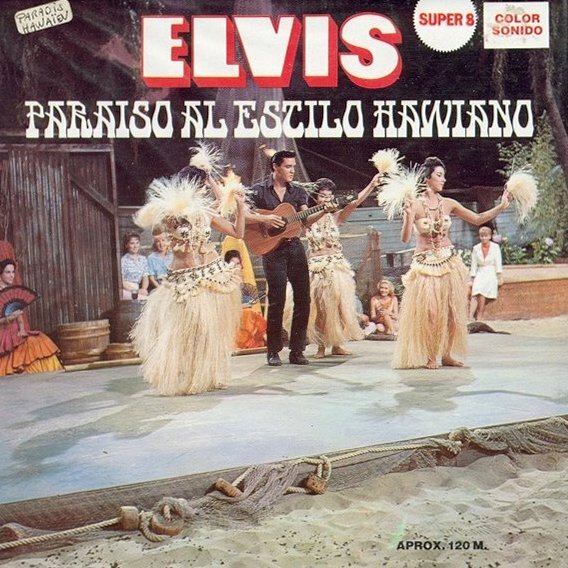 Girls!, Fun In Acapulco, Roustabout and Paradise, Hawaiian Style. 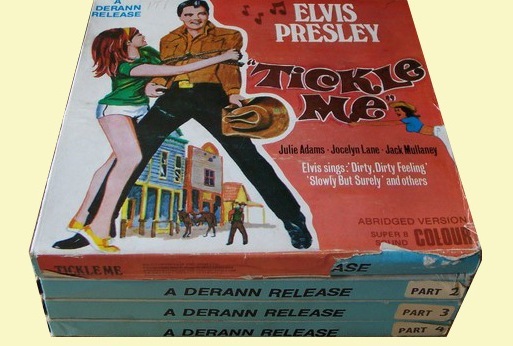 Although the Viacom and Derran releases were identical, the Viacom versions had a more clearer sound and were printed on better film material which meant that the colours of the Derann prints started to fade to reddish over the years. 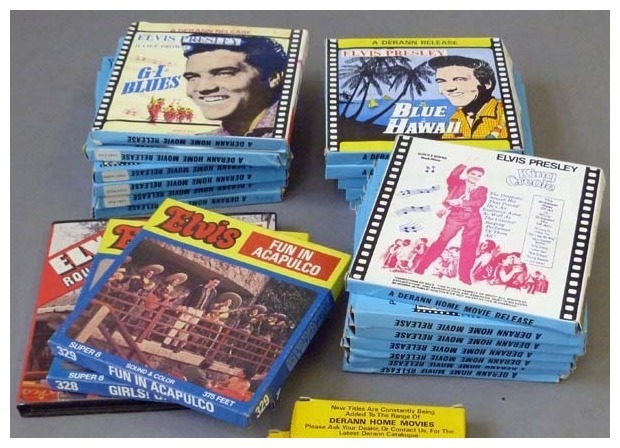 Derann, shortly thereafter, released countless 60 and 90 meter reels containing just a movie-song or trailer, most of which were released with a standard cover and under the title Elvis At The Movies, including No More and Can’t Help Falling In Love from Blue Hawaii. 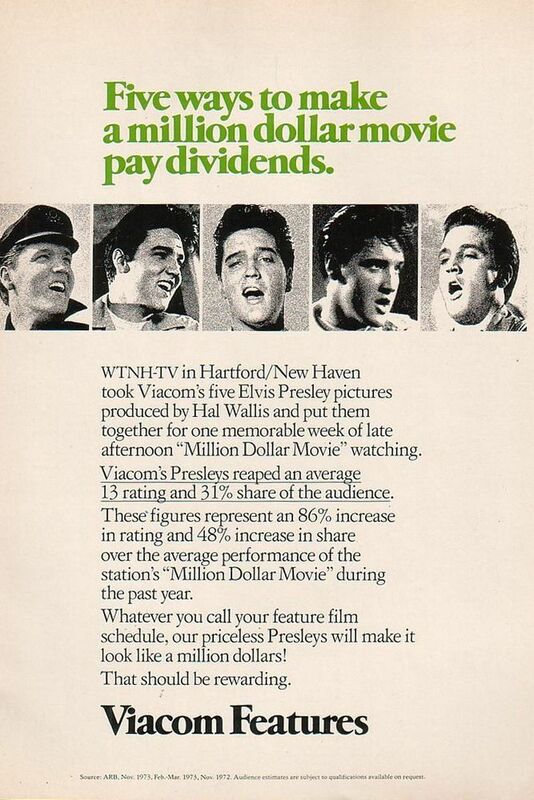 To the left (from 1975) Viacom states that big money can be made off the 5 Elvis Presley movies they own. 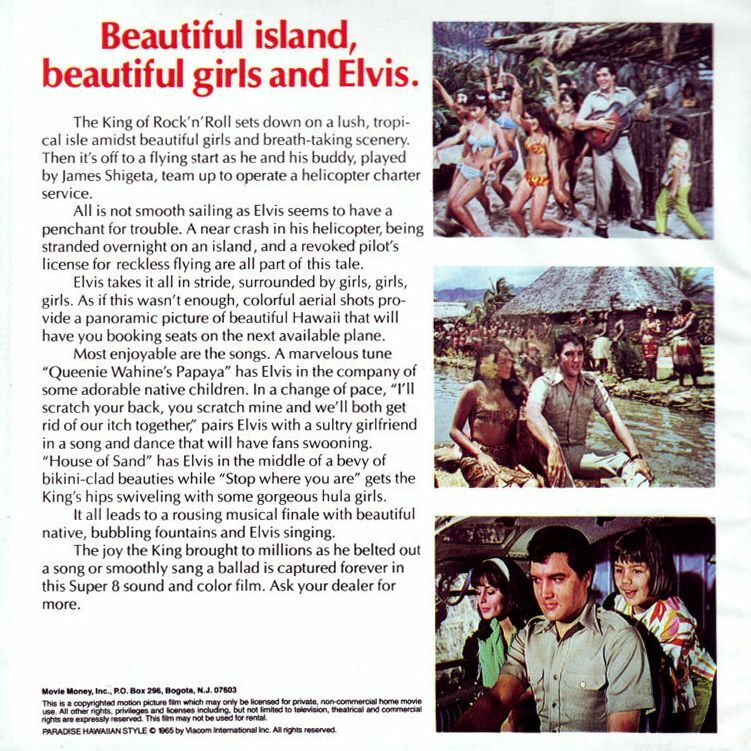 By the time the 1977 ad to the right was printed, Viacom had released their (now 7) Elvis movies as complete versions on 8mm. 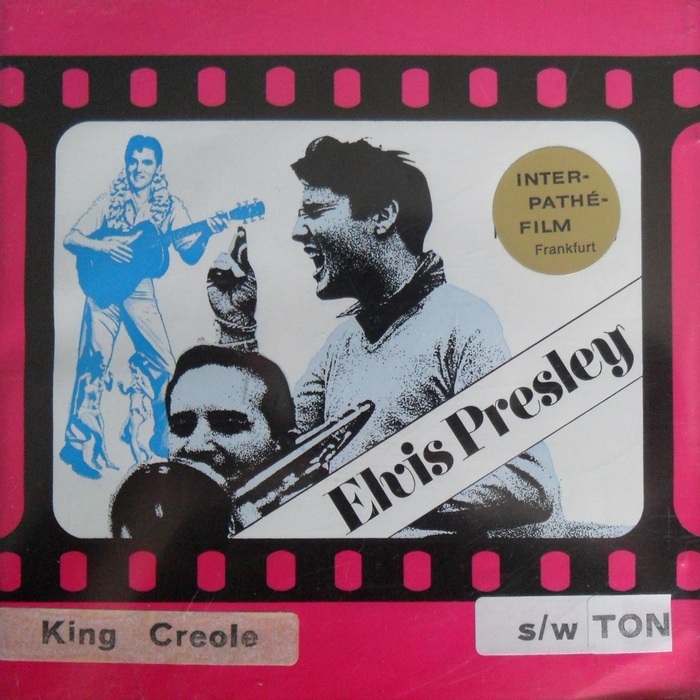 A German imported version of the Viacom release, from the USA, of King Creole on 5 reels. The official German Inter-Pathé release of the same movie. 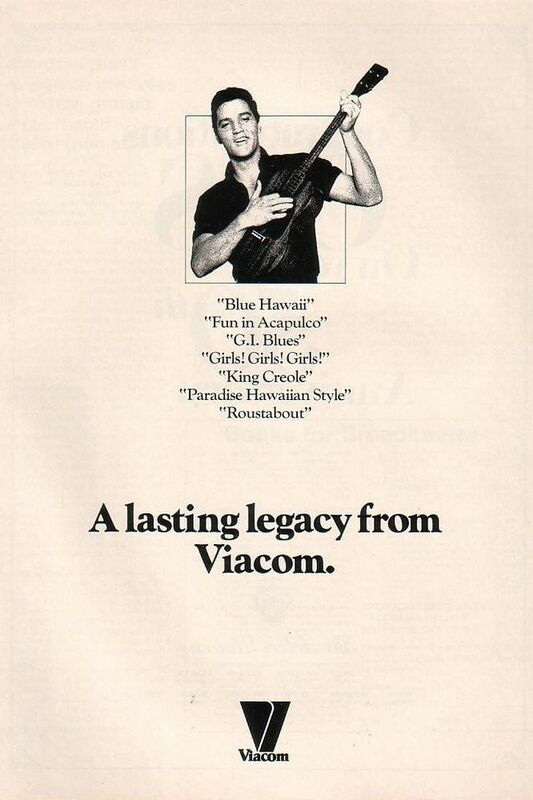 The Movie Money 1 x 400 version (of a Viacom print) of Roustabout. The Movie Money 1 x 400 reel of Paradise, Hawaiian Style, in both the original and Spanish language version. 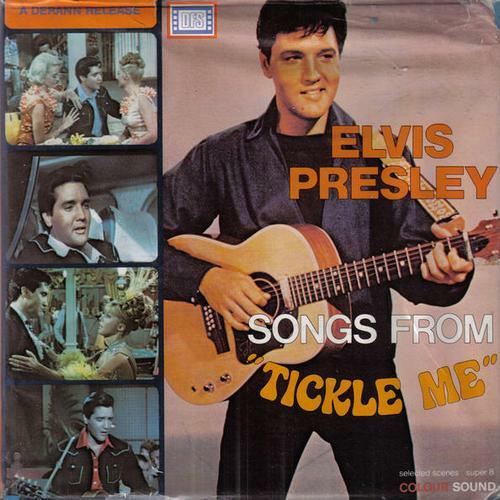 Then came Tickle Me, the first non-Paramount movie to see the light of day. But the quality was very poor and although released in a 4 reels version, it was far from complete. 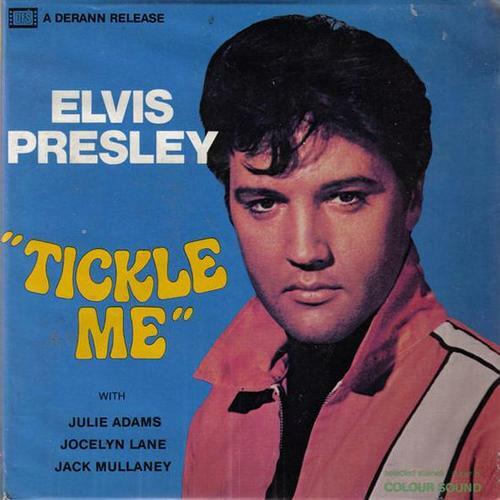 Derran also released a Songs From Tickle Me 120 meter reel which was far more enjoyable and even better in sound quality. Paradise, Hawaiian Style (with the Girls! Girls! Girls! 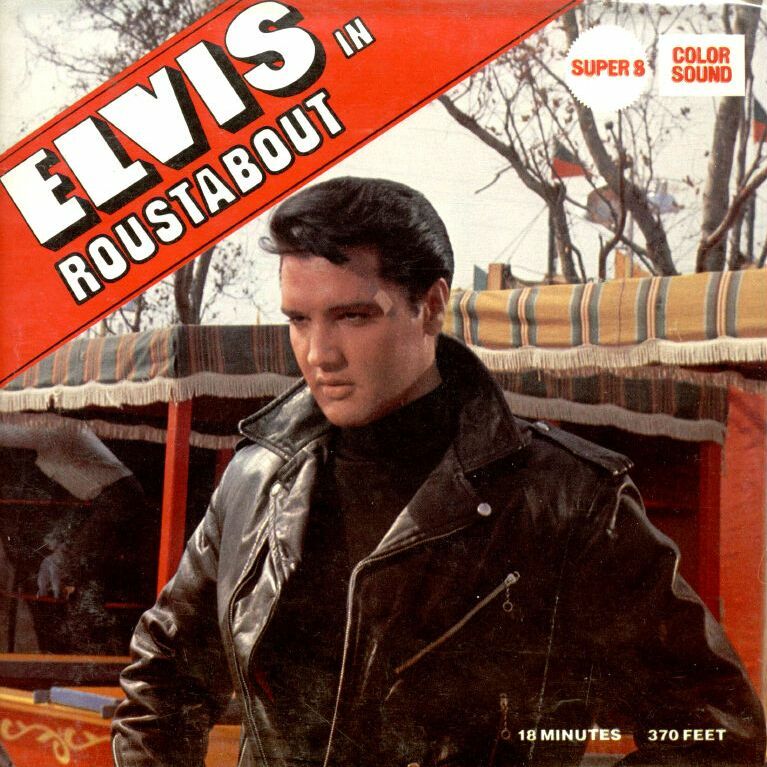 cover), together with Roustabout, was once more released, this time in many different language variations. A simple sticker on the cover (denoting the specific language) was the only difference in the covers of these two 120 meter reels. 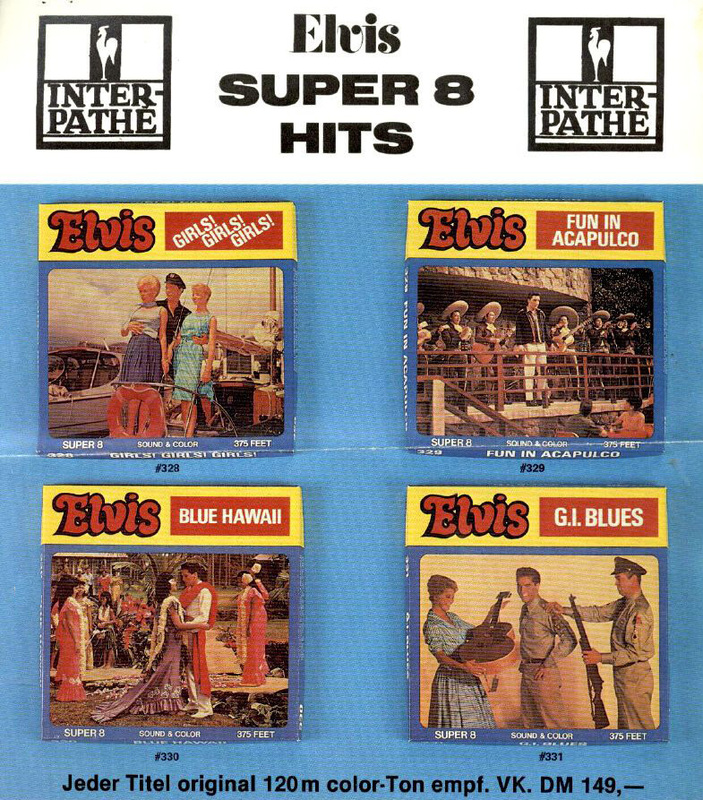 Towards the end of the Super 8 era, there were 4 fantastic releases that did very well with the fans. 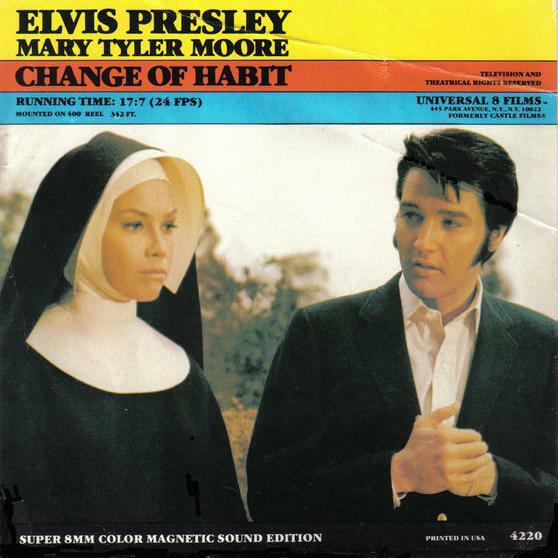 First there was the abridged version of Change Of Habit, released by Universal (1980). 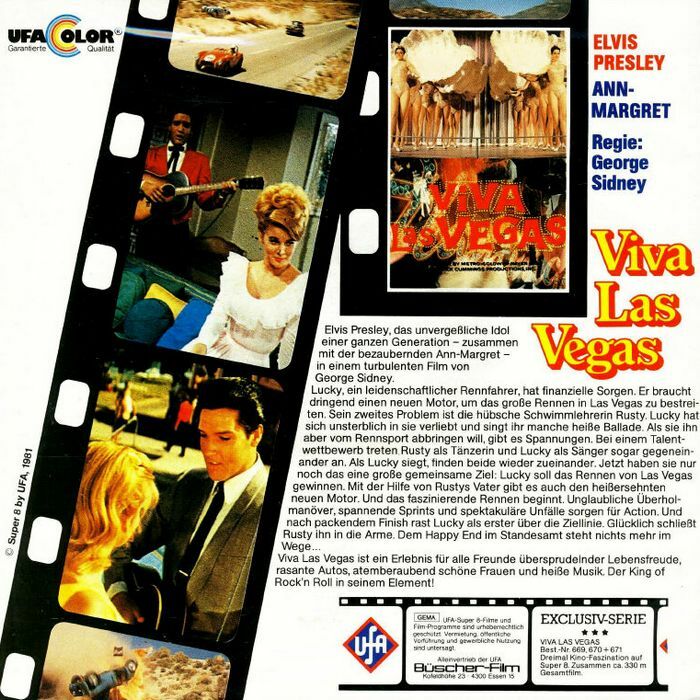 Then came the hit movie Viva Las Vegas, released in Germany by UFA (1981), who also released Elvis The Movie (entitled Elvis The King). 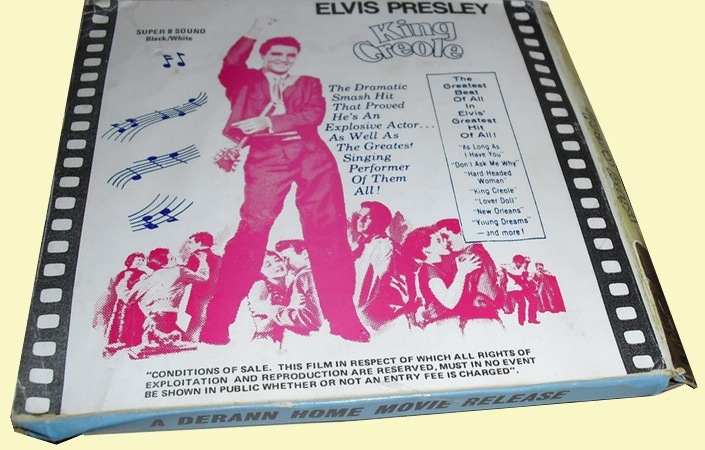 Derann’s final release was an abridged version of Elvis The Movie which focuses on the concert part of the movie. 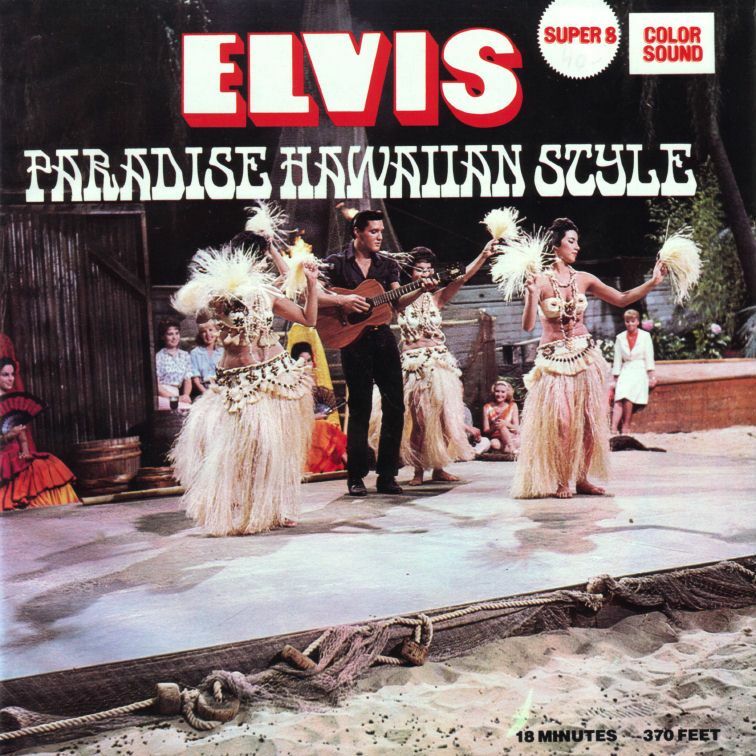 Stay tuned for more Elvis on Super 8 … SOON! Great to read, Gerrit. Looking forward to the rest ! Never knew much about these 8mm films. 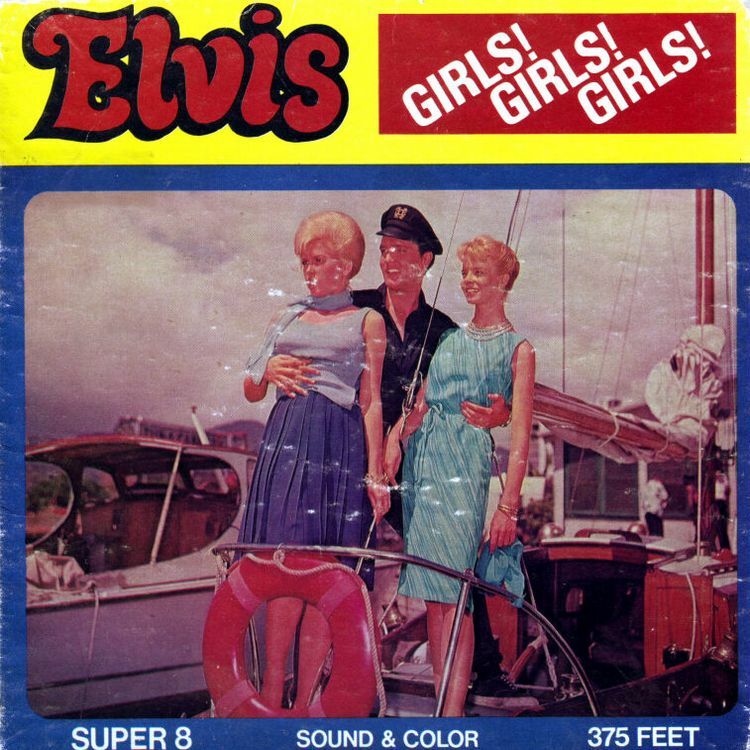 Just wondering a price range on Elvis Super 8 G.I. Blues and Change Of Habit. Thank you. At the time of their release they were about 45 dollars for these 17 minute reels, today with the internet and all they should go for less, but then its important to know about the quality (reddish or scratched) … Hope this helps. Do you want to trade? I have got lots of super 8 films category 3 (unique concert footage, unseen). Hi, I have a old super 8 concert footage from a Cow Palace show … it’s kinda cool, my grandmother filmed it from a few rows back, I remember watching these movies as a kid, and I’m not sure but I think you can see when Elvis hands her a scarf. I have the scarf too … and a few pics of him in an elevator with the negatives … pretty cool. Kjell, what you have is something I would put in the 3rd Category … This super 8 material is so hard to put any value on, these items are as you put it Cool! … Would love to find these gems under my Christmas tree :-) … Treasure it Kjell, it dont get any better than that … WOW. Excellent findings! Never seen before. Thank you for showing us! EDIT: also thanks to Bob-Holland for his excellent view on FECC ‘drjohncarpenter’. Great full page ads Bob … fantastic! 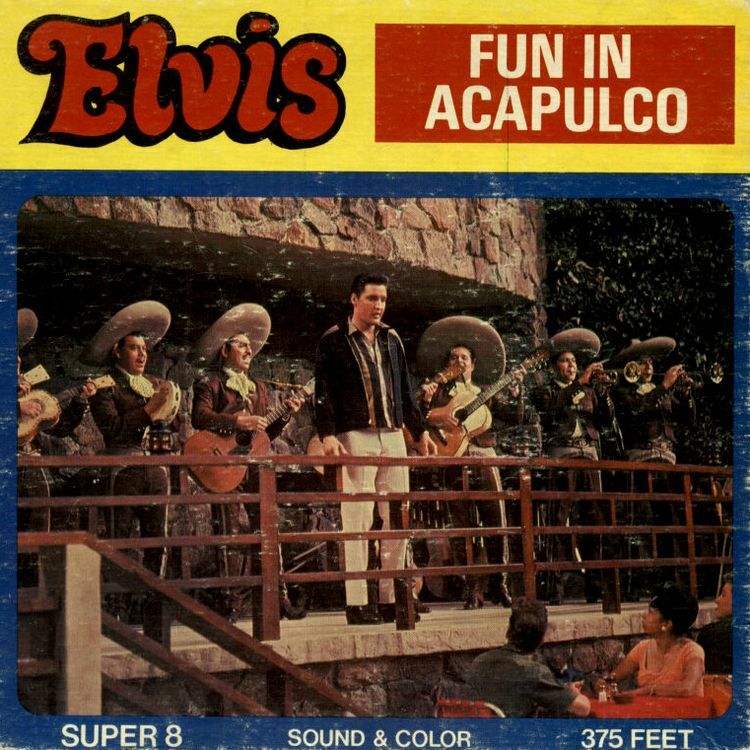 Found an old unsealed Super 8 Elvis Fun In Acapulco from my grandpa’s items in the storage, it still has a price tag of $30. Just asking how much is it in todays value. Depends on the quality Christian. My guess is that you have the one reel abridged version? $30 comes real close. Nice website Gerrit!! You are great. Naomi, credit goes to Bob as this is his site. Glad you like the Super 8 Topic! Great job on this topic my friend! I am also a collector of super 8 sound movies. also have some movies of Elvis Presley. There’s nothing like an analogue home cinema. Hi Fred, always nice to meet a Super 8mm collector! stage in Chicago, 1957, black & white, available thru mail-order in the USA. commercial 8mm Elvis home movie? Ger, as there are three categories in this super 8mm topic, the above deals with the factory made super 8mm reels. The mail order thing that really took off in 1974 (when the market on super 8mm focused more and more on super 8 (single 8mm too) for home viewing, some clever fellows with expensive equipment made own home movies and sold them via mail order and on demand. I recently found paper work dealing with titles such as Hy Gardner Calling, Steve Allen Comedy Round Up, 1972 Press Conference, trailers for Charro, Stay Away, Joe and more, live concert material including Pitsburgh, Elvis In Concert, and much much more, even silent footage of Aloha songs. These are not factory made Super 8 reels but what I call second category (Bootlegged films). The 57 film is from those small companies who made these on demand and asked high prices. A company that stands out on this all is RED FOX, they made a lot of films in a professional style. I recently found a lot of these. Hey friends…here`s a little update…..I recently picked up a 120 meter reel of Tickle me which I assumed was nothing more then the old SONGS FROM TICKLE ME in a slightly different cover as it has the same cover of the 4 reel version I felt something was wrong with the in scripted code on the film…I gave it a watch and I was right…..its an 17 minute abridged version of the complete movie… I did not knew about this release and to make things complete I gave it a mention right here. on Ebay if there are any for sale….. Try the on-line auctioneers. It’s really difficult for a fan to value such items. Hope this was helpful. As Robert said, condition is very important. The brown Red Fox box is the original one. 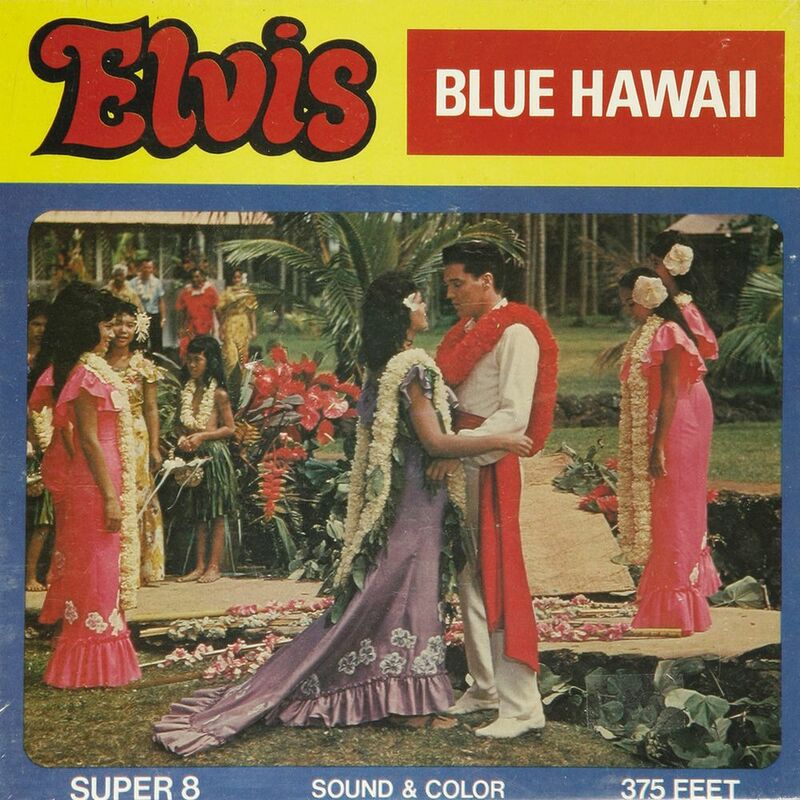 Aloha is clearly filmed from a video. My Red Fox versions cost me around 75 dollar. Aloha and that one did not had any fading or reddish. Very interesting site you have here. 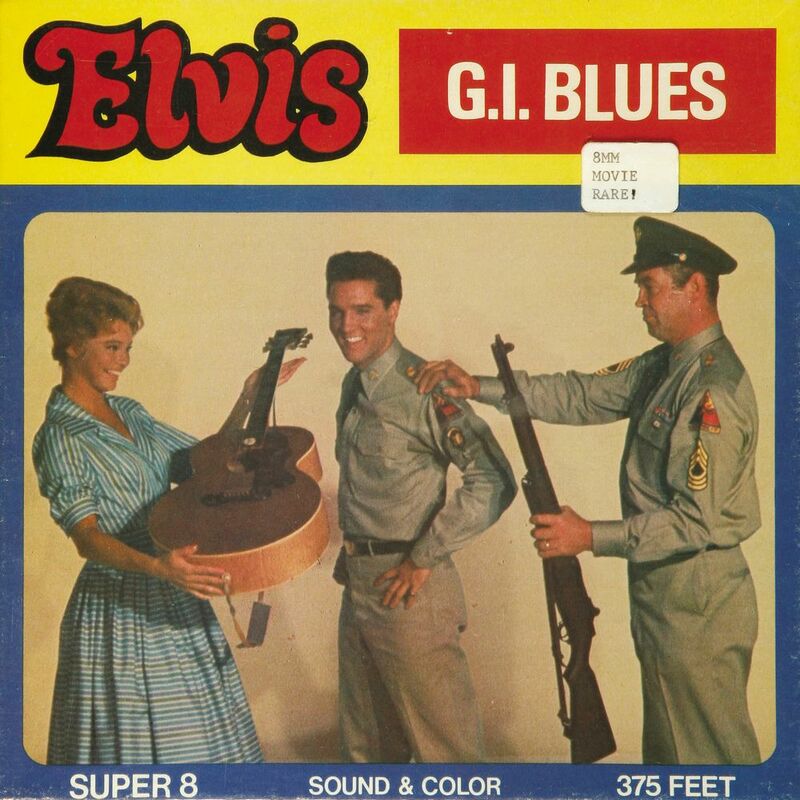 I recently found an Elvis film, GI Blues, it seems to be super 8 but it is over three reels? Can anyone tell me who made it over 3 reels? I think it was re-edited to three reels because all the versions of Derran, Pathé and Viacom are all 5 reelers.